Create a partial class of Entity class and add desired custom method in that. Add a method with WebGet attribute in service class. This method will make a call to the custom method added in partial entity class. Create a partial class for entity class. If you are working on School database and your entity class name is SchoolEntities then add one more partial class along with custom method. To call custom method at client side you need to make call to Execute method on instance of Entity class. Execute is a generic method and it takes return type of custom method as parameter. In this case return type of custom method is string. Execute method returns IEnuramble. 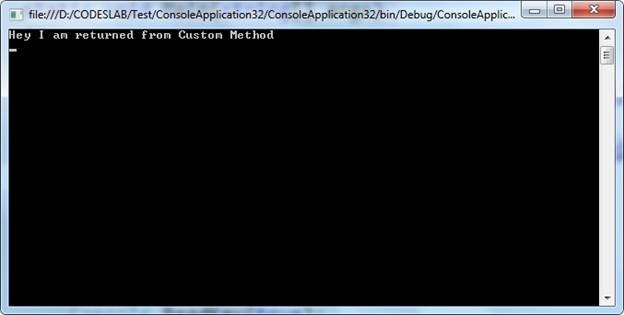 As the parameter to Execute method you need to pass URI od custom method. In this way you can work with custom method in WCF Data service. I hope this post is useful. Thanks for reading.